Earlier this week, I had the privilege of having Peter ("nicest man in the fly fishing industry") accompany me down the Lower Willamette. Fishing from Armitage Park to Harrisburg the past few weeks has been good. One change was this sign at Harrisburg, pictured above. 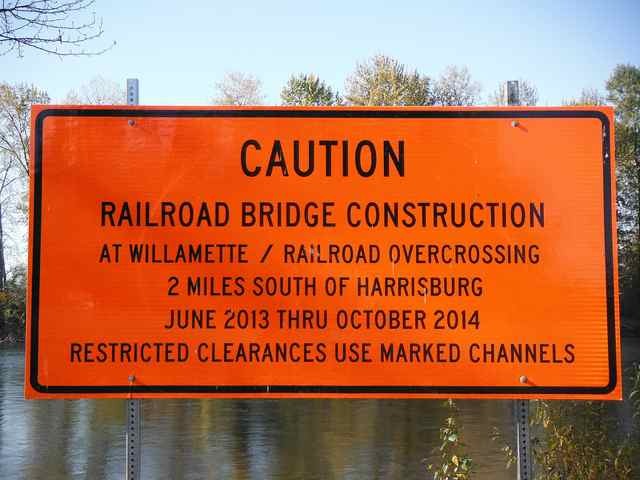 I knew the railroad bridge was under construction but unaware of the length of the project (Completion October 2014). Boaters should look for the center channel for passage, Photo #1. It is clearly marked with signage as you approach the bridge. Some Lou's Brew comparaduns and soft hackles have been working well. Nymphing has been fair to say the least. Jig princes nymphs and Mega Princes have been proven on the upper section of the lower Willamette. The lower section has been good with tan, gray, and cream soft hackles. With the coming storms, anglers should keep a keen eye on the river level and water temperature. Overall, I would expect the fishing to remain solid for a few more weeks. We are fortunate to have such a great river located so close to where we live. Peter does not get to fish often, but when he does, he does very well!